Fusarium head blight (FHB) reduces grain yield and accumulates mycotoxins in wheat kernels and flour and thus compromise the end-use quality. In this study, quantitative trait loci (QTL) associated with components of FHB resistance were mapped in the Kansas wheat variety Everest. A doubled haploid (DH) population with 176 lines was developed from a cross between Everest and WB-Cedar, which are moderately resistant and moderately susceptible to FHB, respectively. Two-year field evaluations were conducted using a randomized complete block design with three replications. Deoxynivalenol (DON) accumulation and Fusarium-damaged kernels (FDK) were estimated using a single-kernel near-infrared (SKNIR) system. Four QTL from Everest were identified on 1BS, 3DS, 4BL, and 5AS, indicating that this variety is a source of native FHB resistance conditioned by multiple loci. A large-effect QTL (Qksu-fhbE-5AS) from Everest explained up to 13% of the DON variation in the 2-year experiment average. A single QTL from WB-Cedar, Qksu.fhbC-1AS, was identified contributing FHB resistance. QTL grouping analysis showed that individuals containing multiple QTL were significantly more resistant, indicating that QTL pyramiding enhances FHB resistance. A 36% reduction in DON content was observed in DH lines carrying all mapped QTL for DON accumulation. Further validation of the QTL mapped here will allow breeding programs to increase FHB resistance in other genetic backgrounds. 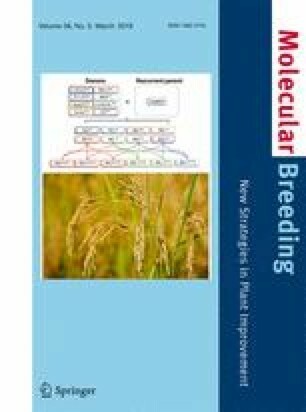 This is the first study that identified QTL associated with low DON accumulation in multiple years of field experiment using the SKNIR technology, supporting the use of this methodology in future genetics and breeding studies. For the first time, DON data estimated with single-kernel near-infrared technology allowed mapping of a large-effect QTL associated with low DON accumulation in wheat. Four QTL associated with native FHB resistance were identified in the winter wheat variety ‘Everest’. The major QTL, Qksu-fhbE-5AS, explained 13% of the DON variation in the 2-year average of the study. The online version of this article ( https://doi.org/10.1007/s11032-019-0937-z) contains supplementary material, which is available to authorized users. We are also grateful for the field and lab support provided by Mark Davis, Angela Matthews, Shuangye Wu, Andrew Auld, and Shaun Winnie. CLS designed the study, evaluated the mapping population, performed QTL mapping analysis, and prepared the manuscript. AF and MC developed the mapping population, assisted with field evaluations, and revised the manuscript. JP contributed with genotyping-by-sequencing data. FD and KP assisted with single-kernel near-infrared spectroscopy analysis. All authors read and approved the final version of this manuscript. The authors thank the Kansas Wheat Alliance, the Kansas Wheat Commission, and the Kansas State Wheat Breeding Program for supporting this research through funding. This work was also partly funded by the US Wheat & Barley Scab Initiative.